A 100 super energy efficient semi custom home community located southeast of downtown Tuscon Arizona on the perminter of historic armory park. This small green community is constructed in a grid pattern fashion with each individual home constructed and utilizing a one(1) kilowatt photoatic watt solar power generating system. To capture the free solar energy from the intense arizona sun a series of ecorater inspections were implemented during the green construction process assuring superior insulation levels, tight hvac ducts, and strigent air filtration. These individal homes are guaranteed to keep year round energy costs at 30.00 dollars a month! Approxmately a dollar a day! All of these armory del sol homes exceed the international model energy code by 50%. This super energy efficient construction results in a monthly operating home cost of less than 30% energy cost of comparable convential constructed homes of the same size and square footage. There is currently two net zero real estate homes in this green community. These homes actually generate more energy than the home consumes. Returning energy back through the grid. Masonary exterior walls constructed with concrete blocks filled with concrete and thermal mass. All external walls wrapped with insulation and filled with a three coats of stucco layers. Energy efficient appliances ie: energy star refrigator, electric range and dishwasher. Twelve SEER rated or higher high efficiency heat pumps. There are seven different architectural syles that are in compliance with historic requirements and are now available to perspective home buyers. Ranging from bungalow, Queene Anne, Spanish revival, and Mission revival, with colors and styles that compliment the Arizona Sonoran desert. The historic armory community homes range in square footage from 961 sq. ft. to 2,059 sq. ft. home. Each home is constructed with super thick masonary walls and a mininium 10 inch thich floor slab. Additional features include metal framing, central vacuum system, security system, french doors,crown molding, tile countertops,metal porch roofs and stained concrete floors. Additional features designed to cater to the green communities residents are: Three foot door openings, walk in bathroom showers, with dual shower heads and grab bars. Extra Wide hallways. Wide sidewalks through out the entire community with extra Wide patio gates for each residence. The entire Armory community is pedestrian and bicycle ecofriendly. With an excellent walkscore thereby health and wellness is a lifestyle factor. Sidewalks are lined with trees and native Arizona eco landscaping. All the energy efficient homes are constructed with a new urbanism feel with front, rear and side porchs and a detached garage in carrage lanes. This certified green community is located less than one mile from the Tuscan business district, Tuscan library, local shopping, Children’s museum and Center for the performing arts. John Wesley Miller is the green builder who conceptualized the Amory community. With more than a fifty year track record as a home builder. Winning many awards, Including NAHB green homebuilder award, serving on the NGBS committee developing the national green building standard. Department of Energy Net zero award. And using solar research from the University of Arizona incorporated into the Amory del sol community. Homes in the Armory park community range in price from the 200’s to the 400’s which is higher than the average cost of a Tuscon arizona home. 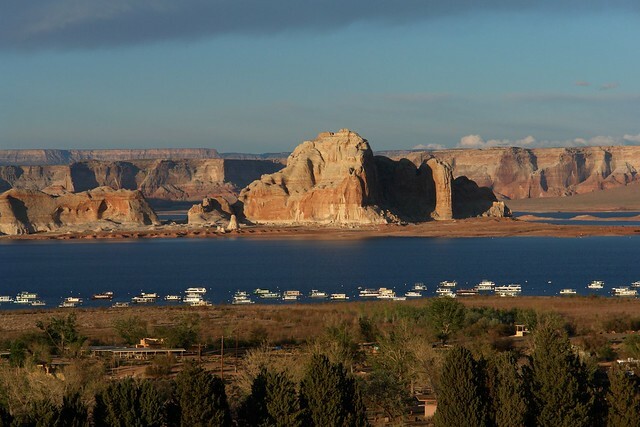 This master planned sustainable community is located in Page, Arizona along the 2,000 mile shore line of lake Powell offering awesome stunning views of Lake Powell. The second largest man made reservoir along the Colorado river in North America. Residents enjoy water front living eco lifestyle combined with numerous recreational opportunities. Boating, water sports, rafting, kayaking, fishing, hiking, ATV trails and horse back riding are just a few of the recreational activities offer at Indigo Ridge. There is also a 18 hole championship golf course located nearby along with fine dining from local restaurants and shopping centers for all the residents to enjoy. Page, is a small town located in northern Arizona, offering scenic natural parks, monuments, Navajo nation Indian culture, close proximity to the grand canyon and Zion canyon, along with all types of outdoor recreational opportunities. The city of Page is the location of several famous movies which have been filmed using the stunning landscape as a background. Some of the notable movies are: The greatest story ever told, Plant of the apes, The outlaw of Josey Wales, Exorcist II, Into the wild, Broken arrow, Superman III and Maverick. Construction from the ground up using local sustainable building material. Water savings techniques and devices constructed in all the homes. Energy efficient construction techniques through the green community. Native indigenous plants used for Ecolandscaping. Indigo Ridge is a 200 acre master planned green community designed by award winning Clay Scrivner design group. Developed in several phases. Phase one release will include 20 acres offering forty five homes and 16 green townhomes with five different floor plans with green homes ranging in size from 1,496 sq. ft. up to 3,360 sq. ft. Additional features include: expansive great rooms, seamless corner windows to highlight the scenic outdoor landscape, using natural stone and venetian plaster to compliment the southwestern contemporary architecture. With new junction from 89 completed and asphalted. All utilities installed and completed, Individual property lots have now been numbered and green construction has started. Contact the local greenbrokers see for your self why sustainable home owners, retirees, and vacation second home owners are now enjoying the energy efficient sustainable lifestyle at Indigo Ridge.